An enchanting holiday activity, ice skating in downtown LA guarantees to delight everyone, from first-time gliders to experienced skaters. Come visit us for merrymaking, outdoor fun and guaranteed smiles at The Bai Holiday Ice Rink Pershing Square. Opening on November 15, 2018, and gliding until January 21, 2019, downtown LA’s favorite ice skating destination is must-do entertainment for all. Plan your visit now! Hours and times vary by day. Skating sessions last 60 minutes. Check our calendar of events for any closed sessions. Purchase tickets online at Eventbrite, our official ticketing partner. Rent skates for $5. Figure and hockey skate sizes range from toddler’s size 8 to adult’s size 15. You may also bring your own ice skates. Rent a Skate Helper for $6. For beginning skaters under 4 feet tall (48”) we offer Skate Helpers, penguin- and bear-looking tools that glide with the skater along the ice and help with balance and control. For safety considerations Skate Helpers are rented at the discretion of Rink Management. Skaters must be able to stand on their own and push the Skate Helper by themselves. Limited quantity. Lockers may be rented for $3 and typically hold a couple of pairs of shoes, a medium-size handbag and a few small purchases. Based on first come, first serve basis. Restrooms are located in Pershing Square Park. Since skates may not be worn outside of the ice rink, we recommend you use the facilities before skating. Available select Mondays and Tuesdays during the 5:30pm & 7pm sessions. On or before 12/11/18: $2,690 for the 5:30pm session and $3,120 for the 7pm session. On or after 1/7/19: $2,190 for the 5:30pm session and $2,920 for the 7pm session (excluding 1/21/19). Sessions are not open to the general public if sold to a private party. Get your card today and earn rewards points every time you visit! Register your card here to get entered to win prizes awarded bi-weekly. At 40 stamps earn “VIP” title and a VIP experience to a rink event of your choice plus a Family Four Pack of tickets. Metro: Skip the hassle of driving and parking and Go Metro. Take the Metro Red Line or the Metro Purple Line to Pershing Square Station. A partnership with Metro allows riders to receive a $1 skating session discount. Plan your trip using the Trip Planner below. Pick up a Metro Bike and go for a ride in downtown Los Angeles. There’s a Metro Bike Share Station at Pershing Square, on Olive & 5th. Find a station near you at metro.net/bikeshare. Need additional information about the downtown LA ice skating experience? Please contact us at 213-278-0909. 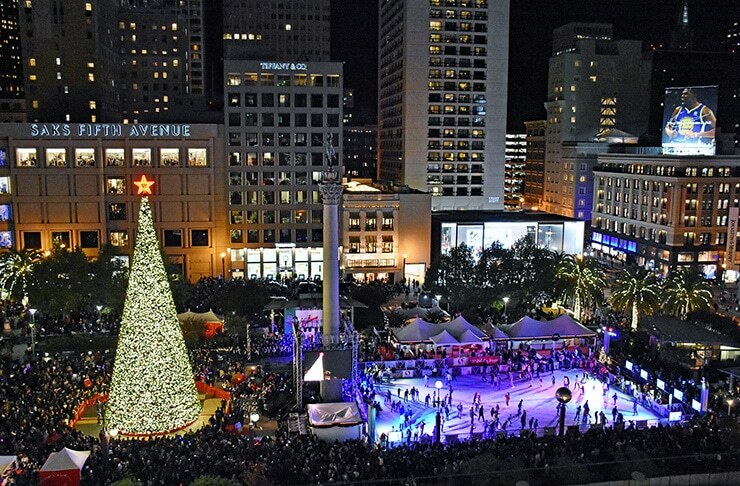 We look forward to sharing our ice and celebrating the season with you at The Bai Holiday Ice Rink Pershing Square. A holiday tradition, ice skating in Union Square promises to bring a smile to everyone’s face and delight you and your skating partners – big and small, young and old. Join us for festive, fun ice skating in Union Square from November 7, 2018, until January 21, 2019. Plan your visit to The Safeway Holiday Ice Rink in Union Square presented by Alaska Airlines – the other cool place to be this winter!